MENDHA. A small adivasi village tucked away in the interior of Maharashtra's Gadchiroli district. In this nondescript village, the residents have raised the revolutionary banner of Mava nate mava raj (Our rule in our villages) - with the help of some outside 'friends- and waged a war with the authorities to gain control over their own natural resources. Now, twice a year these 'friends' flock to Mendha and rub shoulders with the Gond adivasis to study the village's 1,800 ha verdant forests. "This unique experiment - Mendha Forest Study - is helping us concretise our shared dream of gram swaraj," says Devaji Tofa, coordinator, Gram Niyojan evam Vikas Parishad (GNVP), the village organisation which carries out planning and development. "And we learn a lot to enrich the limited extent of our knowledge," points out N R Udemoge, an ethnobotanist. "The forest is our lifeline," says Somibai, member, Mahila Sangathana (ms), which mobilises women to carry out grassroots activities. "For proper resource planning, the villagers decided to take the help of outsiders to study the region's pristine forest that occupies as much as 91 per cent of the village area," says Mohanbhai Hirabhai Hiralal, secretary, Vrikshamitra, a Gadchiroli-based voluntary organisation. The people of Mendha have taken the task of development in to their own hands. "Nobody imposes his or her ideas on us; not even the government," beams Tarabai Alta, member, ms. However, the villagers had to wage a long war with officials on issues like protecting the forest, including their traditional nistar rights (the rights to use forest products for their domestic needs). "In 1989, we started fighting the government to gain our nistar rights following a decision of the gram sabha (the village general body) to build a gotul in the village," says Tofa. 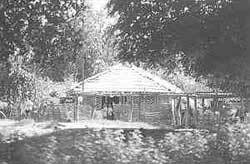 ghotui is the traditional village institution - a youth dormitory which serves as the common forum for the villagers to meet and discuss various issues. The villagers decided to cut the required amount of teak from the forest for building the ghotul without seeking permission from the forest department. The people, under the leadership of the women, chopped enough number of trees. An official crackdown followed. "We built the ghotul in one night. But the next day, forest officials arrived with 300 cops and dismantled the entire structure," recalls Muribai a resident of the village. But it could not deter the intrepid villagers. Today, the beautifully constructed ghotul stands in the village as a monument to their will and determination. As the villagers moved from confrontation to construction, it became necessary to have a detailed knowledge about their forest wealth. Two years ago, the gram sabha unanimously decided to root for the study. In, December 1993, noted ecologist Madhav Gadagil called a meeting of a group of I dedicated scientists in Bangalore. After a three-day discussion, they opted for, carrying out their studies independently; to exchange their findings, they agreed to, meet bi-annually. Hence, once in every six months, Mendha bustles with activity. It is a festival celebrated with the spirit of inquiry and quest for knowledge. Scientists and villagers enthusiastically carry on experiments together in the forest. No formal structure of the study group has been evolved. "The concept was not tol formalise the structure as we wanted the study to take its own course," says Tarak Kate, an inspiring fig-1 ure behind the concept. "Hardly six per cent ofthe village area is under cultivation; even then it is self-sufficient in foodgrain production," says Kate. Nobody sets any agenda to follow. A few committed individuals have graduallyl become involved with the study. Rahul Bais, a 25-yeal old Ayurveda scholar, is the youngest member of the team.4 He, alongwith Satish Gogulwar, a doctor, has identified some medicinal plants in the forest. Musadi (Chlorophyttiml sp), used as a tonic, had reached the verge ofextinction in the state because of its overexploitation by drug companies; this plant grows in abundance in Mendha. The Bais-Gogulwar duo, with a contribution of Rs 5,000 from the gram sabha, are setting up a programe herbal nursery in the village. The plants of the not have nursery will later be shifted to the forest. The agenda, i local vaidu (physician), Bavji Topa, has gained a IhIdho est ot rom t e vIsItors. ave earne ow to make syrup from Bh~ineem (Andrographis sp) to being doj treat malarial fever and Shatawari (Asparagus a piecem4 racemousus) powder for treating leuccorhoea," manner. I says Topa. Mendha's forest is the perfect laboratory for . others as well. Gopal Paliwal, a young entomolo- complain gist studying bees, has been involved with the project since its inception in 1993 (See box: Batty about bees). Other experiments too, are being carried out. Fondly called pittewala (the bird man) by the villagers, Ramesh Ladkhedkar, an orinthologist, studies birds in the local forest. "I aim to make an encyclopaedia of the birds in the local Gondavi language, and a build museum in the village", says Ladkhedwar. Similarly, the Mohini couple -Divakar Purushottum and Sunanda -is engaged in the sociological and linguistic study of the village society. But the project suffers from some problems. Firstly, the entire process is too slow. As the programme does not have a fixed agenda, it has led to the study being done in a piecemeal manner. But no one is complaining. Says Kate, "Change cannot be brought overnight." The funding agency, Oxfam, is showing signs of restlessness. Also, the participation of ne does women in the study seems more symbolic than a fixed real. They rarely go to the forest along with the t has led other members of the team, and during the d open discussions, they come and sit quietly in the back rows. "We lack unity. We don't sit e In together and discuss the issues," admits al Dasasribai Tofa, a villager. The Mendha process remains confined to its own little world. Threats from naxalites, who .treat the development process being followed in Ing Mendha as 'bourgeois', is one reason. Besides, the leaders in Mendha have made little effort to popularise this unique experiment. Lekha, a neighbouring village with a mixed population of 350, remains untouched. The forest protection committee formed in Lekha five years ago to protect its 25 ha forested land lies defunct today, and the villagers are unaware of things like the much propagated joint forest management. The village upsarpanch ( the deputy head), Kamlakar Janjal, blames the people of Mendha for their uncooperative attitude, "Once, we proposed to protect our forest jointly, but the Mendha people refused as ours is a small forest and they didn't want to share their forests." However, Tofa ridicules this. "We were always interested in the joint protection of forest. But whenever we called a meeting, Lekha people came drunk and refused to cooperate," he says.